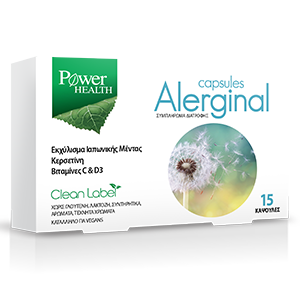 Alerginal food supplement contains vitamins C and D3 as well as japanese mint extract and quercetin. Japanese mint extract and quercetin combined with vitamins C and D3. Active ingredients per capsule: 160mg vitamin C (200% D.R.I. *), 150mg perilla seed extract (Perilla frutescens), 150mg quercetin (Sophorae japonica extract), 5μg (200iu) vitamin D3 (100% D.R.I.*). Take 1 capsule, preferably after meal, as a food supplement, or take as directed by your doctor. Keep in a cool, dry place (up to 25οC), out of sight and reach of children. Keep the product away from heat, light or humidity. Do not exceed the recommended daily dose. Food supplements should not be used as a substitute of a balanced diet. This product is not intended to prevent, treat or cure human disease. Consult your doctor if you are pregnant, nursing, taking medication or facing health problems.